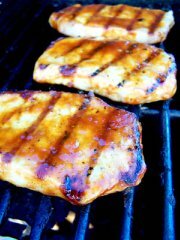 Grilled pork chops are a great recipe for the barbecue days with the friends and the kids. It is a simple recipe of mix it and toss it over the grill. Mix in a bowl the soy sauce, the chili sauce, the lemon juice, the honey and the garlic. Place chops in glass baking dish and pour the marinade from the bowl over the top. Cover and refrigerate 3-6 hours or overnight. To cook, remove chops from marinade and grill or broil 4 inches from the heat until done. If you want to know when the meat is done, watch the meat color. It should turn from red to golden brown.